AlumVax Hydroxide is wet gel (colloidal) of aluminum hydroxide 2%, provided as a ready-to-use suspension. It is sterilized and aseptically filled. AlumVax hydroxide is a crystalline aluminum oxyhydroxide that is positively charged at physiological pH (pI=11), suitable for adsorption of negatively charged, acidic proteins (such as albumin). AlumVax Hydroxide is available in two quantities: 50 mL and 250 mL. AddaVax is stable for 6 months.DO NOT FREEZE.DO NOT FREEZE (ice crystal may impair the product). Aluminum hydroxide is the most common adjuvant used in approved prophylactic vaccines because of its excellent safety profile and ability to enhance protective humoral immune response. Since more than 80 years, it has been observed that aluminium compounds act by a depot effect and also by direct activation of the immune cells. Adsorption or entrapment of antigens in aggregates through hydrophobic and electrostatic interactions favors a high local antigen concentration and improved uptake by antigen presentating cells (APC). AlumVax hydroxide stimulates Th2 response through the release of Th2-associated cytokines (IL4, IL-5, IL-13…) and Th2-associated antibodies (IgG1 & IgE). It increases Agspecific CD4+ T Cell proliferation and promotes NALP3 inflammasome activation and caspase 1-mediated release of IL-1 and IL-18. Preparation of AlumVax hydroxide-immunogens mix is easier than other adjuvants as it does not require laborious emulsification. 1. Ensure complete re-suspension of AlumVax hydroxide adjuvant by vigorous shaking of the vial before use. a. 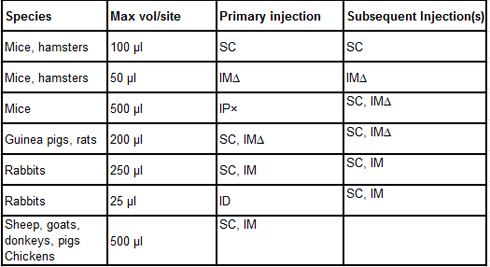 Add AlumVax hydroxide dropwise with constant mixing to the immunogen solution.